Stung by recent criticism over a dysfunctional labour relations environment and cuts to hospital services, South Bruce Grey Health Centre has finally decided to consult the community – on uniforms. The four-site hospital corporation placed a notice in the Walkerton Times inviting the public to fill out a survey on what type of uniforms new multi-purpose workers should wear at the hospital. The notice asks if the public thinks it’s important for the patients and visitors to be able to identify the different roles of the staff at SBGHC, (ie. nursing, dietary, housekeeping, maintenance) by their uniforms. Given the hospital is merging dietary and housekeeping, one has to wonder whether the staff will be required to change between the various roles they perform at the hospital. SBGHC thought less of community input in recent years when it decided to end a number of clinical services at the hospital, including outpatient physiotherapy, without prior consultation. 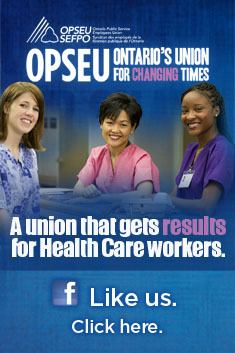 For the record, we are partial to OPSEU blue. Who really cares what color the uniforms are?? I’m sure the patients would rather have REAL FRESH FOOD to eat while they are in the hospital, prepared by the excellent kitchen staff that will be leaving because they have received their Notice of Layoff from SBGHC. OR have the hospital sanitized and cleansed safely and thoroughly so they are safe from contaminants while they are ill. There are other issues going on in the SBGHC work place. Things like major layoffs, unfair withholding of layoff dates so employees can find another job. Volunteers being brought in to do the employees work so the hospital has a “free” work force. The kitchen/housekeeping employees have been given layoff notices but no date of when they are officially finished. Without that date, they won’t be receiving their $$ packages, let alone be able to start another job. If they quit SBGHC, they give up their packages. Health Records Department have lost 2 full-time employees and the transcriptionists are looking at their positions eventually becoming fairly redundant in the relatively near future. It’s all about budget. Employee morale is no longer existent at SBGHC and the work environment is toxic for those of us “lucky” enough to still have a job there. What can I say but hopefully “what goes around, comes around”. Many employees are bitter and sad that they have given their heart and soul to make the patient’s stay a healing, healthy, safe environment and that has been taken away through those unmentioned making sure they meet a “budget”. It’s no longer about the patient! It’s no longer about the faithful employee! It’s all about budget. I am thoroughly amazed that the hospital would seek input from the community for uniforms but not on services. This is a truly “mickey mouse” gesture from the CEO but I guess the costumes are more important than the work the employees perform.